Bayano Lake was created from Bayano River and its feeders after the construction of a dam and hydroelectric plant that provides the city of Panama and other areas, electricity today. The lake is divided into three zones interconnected by a total of 135 square miles (350 square kilometers). 80% of the lake shore is within the region of Madungandí, populated by indigenous Kuna, Embera and Wounaan, Amerindian people. Bayano Lake is a jewel of Panama, with a spectacular environment that is home to hundreds of birds and other animal species, some of them very rare. Chief among its many splendors, is found in the caves of Lake Bayano in Panama. The caves were formed over many centuries by an underground river that still flows today, the erosion of limestone, and a combination of several factors as wind and floods. The path inside the cave lasts about four hours, with mostly easy parts. However some parts are moderately difficult, requiring more physical effort. The terrain includes river crossings, large rocks, slippery ground etc. There are areas where light penetrates to areas where we need to use lamps. 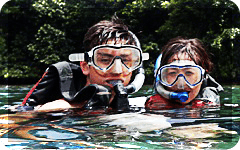 There will be deep waters within the caves, so the swimming is necessary. Inside you will see water drops from the ceiling giving the appearance of waterfalls, different rock formations and a diverse fauna. This tour requires physically healthy and adventurous spirit, invites nature lovers or those wishing to relax from stress and city noise. From early morning the tour starts from the capital to the Lake Bayano important natural resource of Panama. Upon reaching the caves, ready to start this beautiful and impressive route over a canyon full of passages and huge caverns where you will find a variety of small animals that inhabit this ecosystem without sunlight; crystalline lagoons; huge limestone rock formations, formed through the centuries until it ended in a lagoon where you can enjoy a refreshing swim in small crystalline waters. This route has an area of about one kilometer. Different birds species can be watched: Neotropic Cormorant, Great Blue Heron, Green Heron, Great Egret, Black Vulture, Osprey, Broad-winged Hawk, Ringed Kingfisher, Tucans, Great Kiskadee, Crested Caracara; Mammals as Mantled Howler Monkey, Neotropical River Otter, Three-toed Sloth, Norther Tamandua, Short-tailed Fruit Bat; Reptiles like: Green Iguana, Brown Vine Snake, Tiger Ratsnake, Fer-de-Lance, variety of amphibians and butterflies. 7:00 AM Pick-up from your hotel in Panama City. Land transfer to Guna native community on Lake Bayano. Boat ride on Lake Bayano to the entrance of the caves. River trekking/cave-canyon exploration and lake. Lunch prepared by locals (or picnic type sandwich lunch). Return to native community and transfer to your hotel in Panama City (ETA 4:30 PM). WHAT DOES IT INCLUDE ? All mentioned transportation, guides. 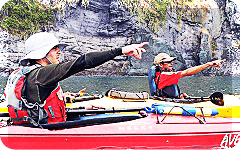 Our guides are trained in with navigation skills, first-aid and CPR. WHO CAN GO? Any person from twelve to seventy years old, in good health. Minors must travel with a responsible adult. WHAT SHOULD BE BROUGHT ? Wear comfortable outdoors clothing (long pants or shorts, long sleeve shirt or T-Shirt, (dry-fit material is best), hat). shoes above the ankle, preferably boots or sneakers with good grips; wear insect repellent ,and sunscreen. A complete set of spare clothing to change and return dry. WHAT SHOULD NOT BE BROUGHT ? No sandals flip flop typ. Any object than can be deteriorated by water or valuables like jewels, cash, credit cards, etc. Do not forget your ID....It is mandatory for every participant to bring along an ID that confirms that he or she is legally in Panama(such as an stamped passport). We will pass through a road immigration's check point, close to Chepo, and if you do not bring proper ID, you will be under immigration custody for more time than you can possible think as reasonable. We wont delay the group itinerary if a participant forgets his/her ID and we wont be able to assist you on this matter until our return.... Do not forget your ID.